Clear-looking to the east this early Friday on California’s north coast, and a bright sun-up if the fog don’t get here first — chilly a bit now, though, supposedly we could see/feel 70-degrees today. Unlikely to happen, as this afternoon’s wind-chill factor will keep any soothing warmth out of the air. Although we’re a few minutes to official sunrise, it’s been light for about an hour or so, and this little period a ‘peak-early-light‘ time — don’t seem to last long, though, a few weeks maybe, and soon back to ‘darker-longer‘ in the mornings. (A lament of an way-too-early riser). 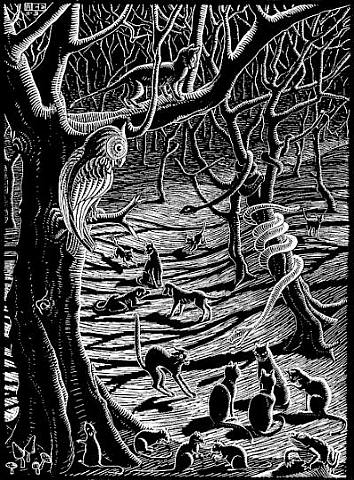 (Illustration: M.C Escher’s ‘Scholastica,’ found here). Harris’ office is conducting criminal and civil investigations of the oil spill and its aftermath. She visited the cleanup command center Thursday, meeting with officials from more than a dozen federal, state and local government agencies. Harris’ tightly choreographed visit came as she runs for U.S. Senate and had all the trappings of a campaign event. For decades, candidates have used Santa Barbara County’s scenic coastline as a backdrop to highlight their dedication to protecting California’s environment. Harris’ aides barred the media from most of her tour, allowing her to be photographed only from a roped-in area at Refugio State Beach, with the turquoise ocean behind her. The visit was the latest of many displays of how Harris’ state duties dovetail with her political needs for the June 2016 Senate primary. Two weeks before an oil pipeline rupture spilled over 100,000 gallons of crude on the Santa Barbara coast, a test was run that would reveal serious wear in that stretch of corroded pipe. Preliminary results showing the pipe lost nearly half the metal near the break vastly underestimated just how thin the pipe had become. Federal regulators said Wednesday that examination indicated more than 80 percent of the pipe had worn down. The new finding does not pinpoint the cause of the May 19 rupture, but it exposes possible short-comings with the technology used to gauge pipe reliability and with those who analyze the results. Whether a more accurate test could have prevented the spill seems unlikely because Plains All American Pipeline, which operates the pipe, said it had not received the results at the time of the spill. It typically takes several weeks to analyze data from high-tech instruments that can gauge the thickness of pipe walls, detect cracks and measure internal and external corrosion. The instrument known as a smart pig, however, has limits. “The smart pig term is an oxymoron,” said Robert Bea, civil engineering professor emeritus at the University of California, Berkeley, who has worked three decades with the pipeline industry. However, the agency also said corrosion “would not be expected” with the system running at that level, posing another riddle. The report noted that the area that failed was close to three repairs made because of corrosion found in 2012 inspections. It also said the smart pig tests revealed that three other sections of pipe had extensive corrosion with metal loss ranging from 54 percent to 74 percent. “Those devices are not 100 percent,” said Don Deaver, a former Exxon pipeline engineer who now works as a consultant and expert witness, primarily for plaintiffs.